We’re a team of creators and makers who like to read. The idea behind our bookmarks was to create something which will add a stylish touch to any book you’re reading. Thus our metal CoolBookmarks were born. The bookmarks are laser cut out of thin metal, hand polished, bent into shape and powder coated with durable paint. We choose imagery and symbols which mean something to us. Could be life or pop culture. They cause an emotion when you open a book where you left off. They trigger a smile when somebody looks at the the book you’re reading. Reading is good for you - read in style! Packaging of our bookmarks is also cool - we reuse palette wood for it. The bookmarks look unique and ready to give. ...The fox from the The Little Prince. Beauty school drop out! I want this one. I'm a hipster and still have that icon. How do we get these bookmarks? We’re a team of creators and makers who like to read. 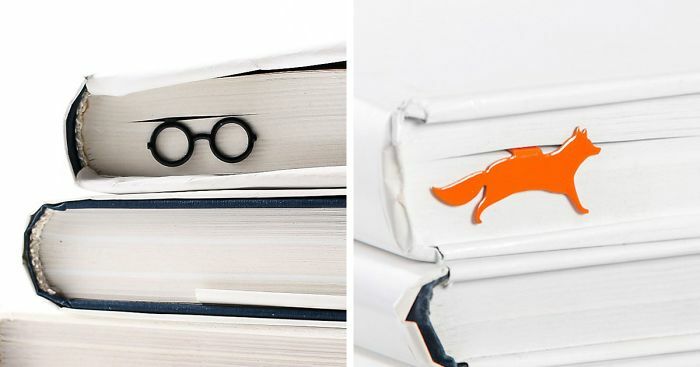 These bookmarks are so innovative! Where do you buy em? Visually I love them, on the other hand I suspect that if you want to put the book down on the last fifty pages or so you might have a problem, especially with those like the arrow and the scissors that cant be turned upside down. Thank you! There's no problem turning the bookmark upside down as you read through the book. The arrow and scissors will change the direction as you rotate them. Yes, I realize that you can turn them around, what I meant was that while the others can be turned upside down when you approach the end of the book, so that they don't protrude, the scissors and the arrow appeared to be centered.